Sgt. Edward Flak II reacts as his overhauled Mustang GT is unveiled. Marine Sgt. Edwrad Flak II thought his 1994 Mustang GT was just going into the shop for a few minor repairs. After he returned from Afghanistan during the weekend, Flak was surprised Monday when the garage door was lifted on the car. It sported a new body kit, sound system and paint job. The yellow ribbon is not standard. The car was unveiled at Bird Family Tire & Auto in Temecula. Flak served three tours overseas. 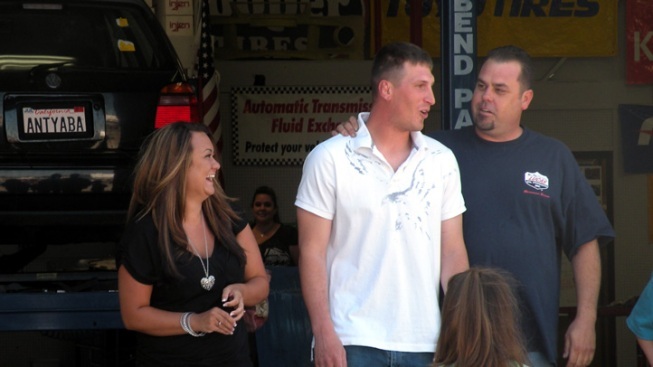 His wife planned the automotive makeover, which was revealed in front of family and friends.